They were just browsing and passing through a front yard in Jacksonville, OR, this morning. 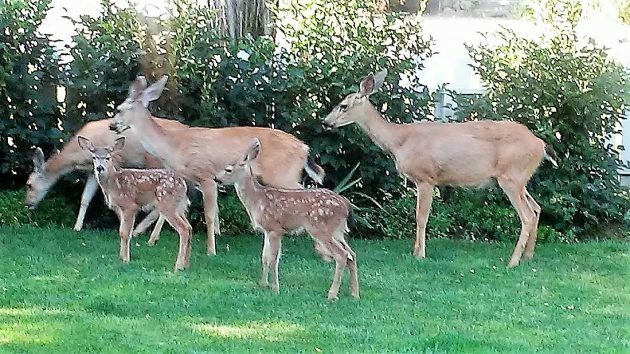 Albany may not have a problem with too many deer, but some Oregon cities apparently do. To help them, the legislature passed Senate Bill 373, which calls for a way to get rid of some of those urban deer. The governor has signed the bill, and it becomes law on Jan. 1, 2018. It calls on the Oregon Department of Fish and Wildlife to set up a program that could, theoretically, result in authorized hunters shooting deer in cities that want this done. But there are steps that would have to be taken first. To begin with, a city with a deer problem must pass a local law forbidding the spreading of food that attracts the animals. Right away, you can see the snag. Lots of people have bird feeders in their yards because they enjoy watching the finches and towhees and so forth. Those people are going to fight any ordinance that keeps them from filling their feeders with sunflower seeds, and if that fails they’re going to ignore the law. Once ODFW has adopted the obligatory regulations and the program is set up, a city could declare deer to be nuisance and petition the department to authorize the “taking” of deer by agents of the department or the city. Imagine the public hearings where “killing Bambi” was the idea. And when the hunt is on, hitting the animals with tranquilizer darts and then hauling them off to be killed would not be allowed. Under the bill, salvageable parts of the carcasses are to be made available to food banks, and who wants a little tranquilizer in his meat? The law says the urban hunters could take only as many deer as necessary to reduce the nuisance. Presumably it would be up to the local council to define exactly how many that is. Buy Cialis over the counter from https://www.caladrius.com/order-cialis-cheap-20/ trusted healthcare providers. Few threats equal the threat posed by urban deer. If they possessed opposable thumbs, humans would be in trouble. I am glad that the State has recognized this serious threat and created a solution. Now, we must rely on the august body, the Albany City Council, to pass supporting legislation which will allow humans to once and for all to protect themselves from this dire threat. I call upon the mayor and the council to address this burgeoning threat before we are further threatened. Perhaps Albany Community Police could capture the offending, criminal deer, take them to the downtown Carousel basement and put them is a squirrel cage used to generate the electricity needed to operate the Merry-go-round. Some may object, but if the problem of Rogue Deer is as great as the State legislature believes, creating slave-labor by ensnaring these irksome creatures seems a sound solution. Well, if a local law is needed, let’s get started. The city council should appoint a task force of surrogates (city residency not required) that will meet for six months to diagnose the problem, distinguish symptoms, and identify root causes in a comprehensive way. The council should then engage the stakeholders (various city commissions and private groups, including the HRC) to ensure harmonious understanding and community participation. The city attorney should be there every step of the way crafting the law to withstand legal challenge, even though no layman will understand what the law allows and forbids. The council should then schedule multiple Monday working sessions to air out each councilor’s political concerns. The council’s output should then be referred back to the stakeholders to ensure the final draft is sufficiently diverse, inclusive, and achieves social justice. Finally, the city attorney should present the final law at the regular Wednesday council meeting. And after more debate, with the ordinance failing by a 4-2 vote, the council should thank everyone for their community service and kick the can down the road for a future council to deal with. Or, just let CARA hire a local hunter. I mean, urban deer are clearly a blight on downtown and CARA’s mandate is to eliminate blight in all its forms (both real and imagined). And who speaks up for the “Bambi’s” as it is we that are encroaching on their original stomping grounds! What would the council do to determine nuisance deer? Have the community Police capture & put a visibility vest on the “good” ones to prevent their being harvested?? Betcha PETA is gonna take a dim view of this bill. Just how much “salvageable meat” could be on a tiny Black Tail in the first place to make it worth butchering? HH, I was going to say I really liked this Bambi story. Seems a convoluted mess until we get to any kill shots but hey! Perhaps what I really liked was no endless hand wringing about CARA and some perceived tax theft. The Legislature and city councils deserve the headaches that come with this stupid law. All that bill will do is polarize the locals. It solves nothing. We need easily dispensed birth control for deer. No politics needed. Some say humans encroached, others say deer are a danger. The facts are available. How many accidents caused by deer? Are there diseases they spread? Is the erosion they cause a threat? Do they attack humans and dogs? Are they prohibiting gardeners from growing both foods and decorative plants that enhance diets and neighborhoods? Are our water features contaminated by the deer? Is their pooh distributing contaminants to the water and ground? Are the herds healthy or are deer dying in our back yards causing a waste removal problem? Let’s use facts instead of emotions. And if you want to use that encroachment argument, talk to the Native Americans or Mexicans upon whose West Coast homes white folks encroached upon. I had a peeper the other night outside my home adjacent to the field where a developer hopes to house 300-plus people in North Albany. The face was right up to my window, and I stood still, hoping to be unnoticed. We stared at each other, then the little doe went back to eating on a rose bush. I used stealth to draw away from the window. The encounter was lovely, and the rose bush is doing fine.